Plum trees (Prunus spp. ), cold-hardy and fairly low-maintenance fruit trees, thrive in the home landscape. Plum trees are also smaller than other types of fruit trees, making them suitable for smaller yards. Some plum trees are purely ornamental, while others are grown for the fruits. 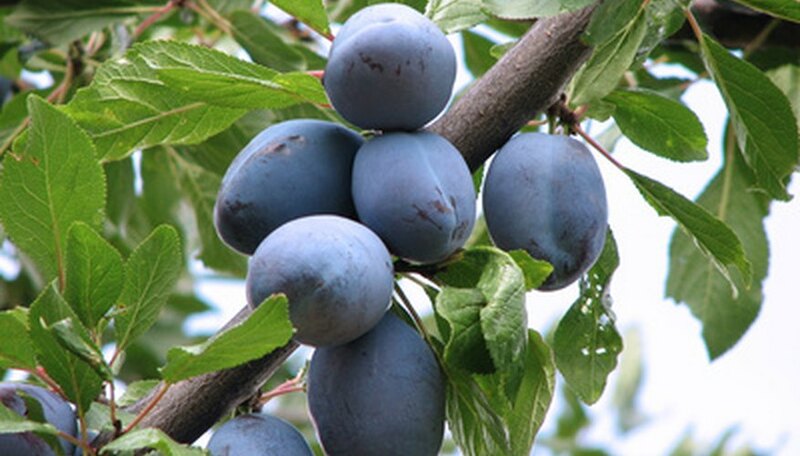 Three main types of fruiting plum trees are Japanese plums, European plums and American hybrids. Although some plum tree varieties are self-fertile, plant at least two varieties of plum trees to ensure good cross-pollination and fruit production. Water your newly-planted plum tree deeply and thoroughly once every week to soak the soil down to the root ball during its first growing season. In subsequent years, water the plum tree deeply once each week from spring until autumn when rainfall is less than 1 inch. When watering, apply 2 to 3 gallons of water per plum tree. Spread a 2- to 3-inch-thick layer of organic mulch on the ground around the plum tree to cover its entire root area. The mulch will control weeds around the plum tree and preserve soil moisture. Feed your newly-planted plum tree with a nitrogen-only fertilizer about two weeks after planting it, following the instructions on the label. In subsequent years, feed the plum tree a 10-10-10 NPK complete tree fertilizer once each year in spring at the dosage rate recommended on the package. Cut back the plum tree’s main stem to about 30 inches above the ground level immediately after planting it. Prune away all damaged branches from the new tree. Train and prune your plum tree to an “open center system” by selecting three or four of the strongest branches on the tree after the first year of growth. Prune away all other branches from the tree, cutting them back to the trunk. The selected branches should be evenly spaced and balanced on either side of the trunk. Harvest the plums when they're fully ripened on the tree for European varieties or just before they ripen for Japanese plums. You'll know that the plum is ripe when the fruit feels soft to the touch and separates easily from the twig. Watch out for the disease "brown rot" infecting your plum tree. If you see brown, withered growth, dead blossoms on the twigs, brown sunken areas on the twigs, and gum-like, sticky brown drops on the base of the dead flowers and twigs, your plum tree may have brown rot. Brown rot also causes gray or tan velvety spots on the flowers and fruits. Treat brown rot by pruning away and destroying all diseased fruits, twigs, flowers and leaves, and applying an appropriate copper-based fungicide, such as myclobutanil, at the early bud stage. University of California: Brown Rot – Monilinia spp.